New Yorkers love a good steak. (Maybe, even, a little too much.) You could theoretically occupy yourself, definitely against the wishes of your doctor, simply eating all the different rib eyes, strip steaks, and other cuts around town. The only problem being that this is a never-ending task, and there are always new steaks to dig into. But it’s been a good season for beef-eaters, especially ones hungry for more than the usual chophouse renditions. Here, 12 new steaks to eat. 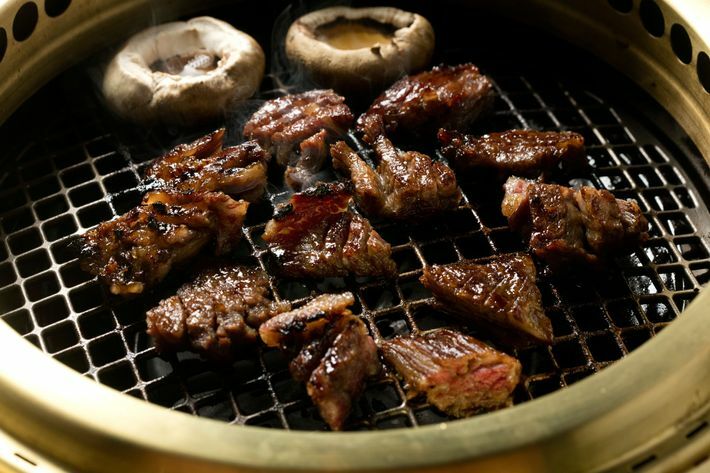 This restaurant combines the best of Korean barbecue and the American steakhouse. The centerpiece of the menu is the butcher’s feast, a KBBQ-style spread, so supplement that with kalbi, the marinated short rib that’s everyone’s favorite grill-it-yourself meat. 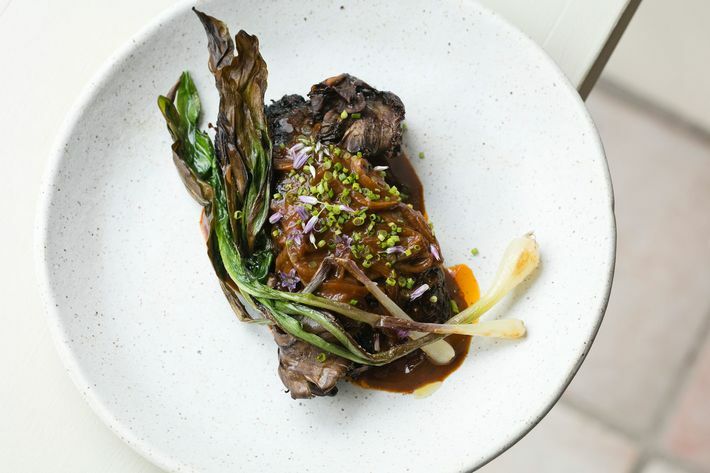 The Fort Greene restaurant takes cues from both the Middle East and Italy, as in this dish of hanger steak with seasonal vegetables (like asparagus and garlic scapes), and a condiment that blends zhug, the Yemeni hot sauce, with Southern Italian salmoriglio. Down in southern Brooklyn, the popular Thai restaurant’s second branch serves new dishes like nuer yang, a meat salad of steak marinated with aged fish sauce and Chinese sweet soy sauce. It comes with steamed bok choy, sticky rice, and a tamarind-chili dipping sauce. At this Mexican newcomer, the beef is smothered in cooked-down onions, with chile meco or chipotle, mushrooms, fried yucca, and bone marrow rounding out the plate. 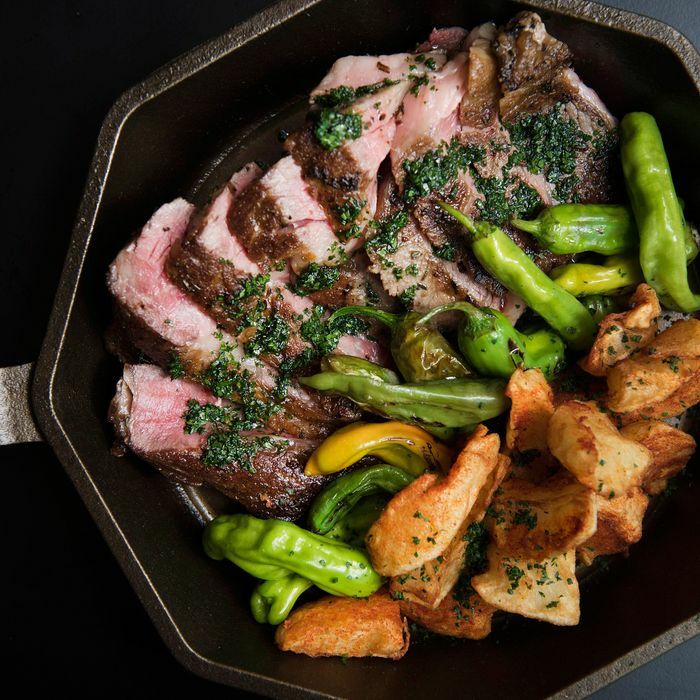 While dishes cooked in cazuelas, Spain’s traditional clay vessels, are the focus here, the Basque restaurant from Jose Garces also offers a 24-ounce, dry-aged rib eye with green chilies and potatoes. The West Village bar specializes in yōshoku (or Japanese-style Western dishes) like bifuteki, here skirt steak dressed with a sweet-onion sauce and served with fried fingerling potatoes. Food Network personality Anne Burrell’s first New York restaurant features a dry-aged rib eye with potato-bacon-Fontina cake and grilled broccoli rabe. The breezy East Village restaurant specializes in seafood, but it’s not all fishy. There’s also a New York strip, served with fried artichokes, olives, and beef jus. Almost everything at this South American restaurant is cooked over a wood-fired grill, including the short-rib steak with chimichurri and greens. Aska chef Fredrik Berselius and restaurateur Claus Meyer aren’t above cooking New York’s favorite cut of meat. 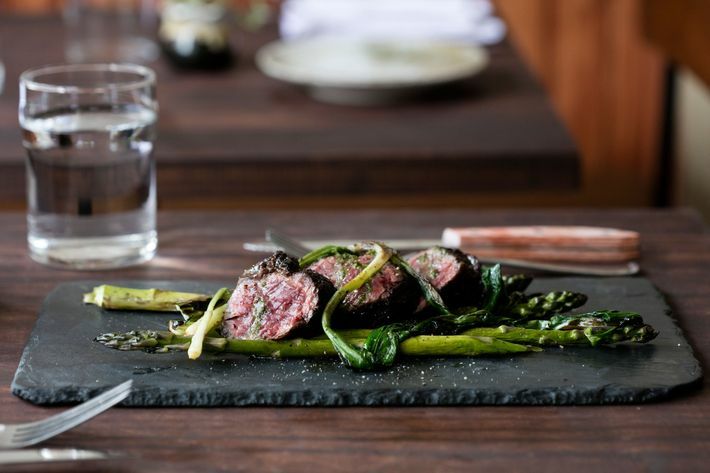 At their Scandinavian restaurant, they serve a dry-aged New York strip with green cabbage, white onion, and chamomile. Skirt steak gets marinated and grilled at this Chelsea newcomer, which pairs its beef with Gruyère fondue, bacon, shiitakes, bitter greens, and Granny Smith apples.